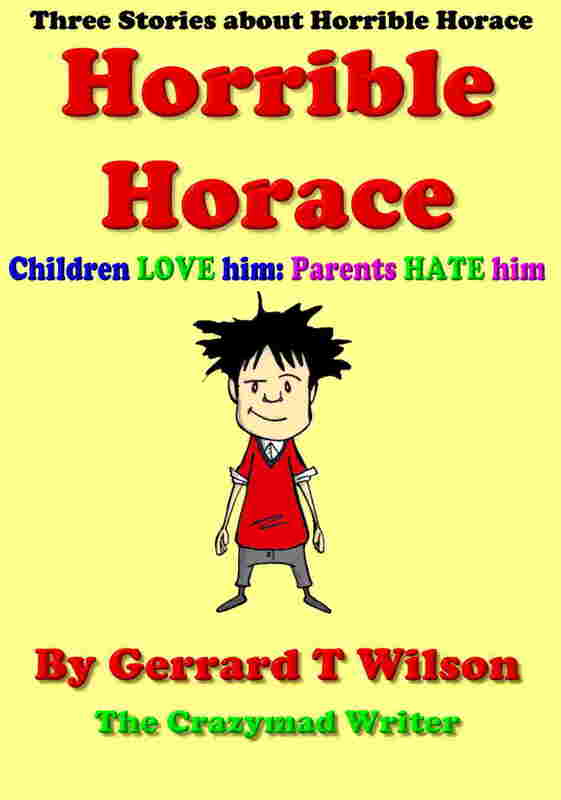 This book contains three stories, all of them about Horrible Horace. The first is about his recent kite flying experience, the second is about a little vacation he decided to take one day, and the last story is about his teacher, Miss Battle-Scars’ school chair. I hope you enjoy reading them. “They’re late,” his wife, scolded. “Off with you, Horace and Maria,” she ordered. Opening the front door, she ushered them out from the house. “I’ll follow you, on my bicycle,” she told them. “I will catch up with you before you get to the crossroads.” Although Horrible Horace’s mother dispatched her children to school on their own, each morning, she made a point of being with them at the busy crossroads a mile from home. “But I haven’t yet shown them what’s in the bag,” her husband protested. “It can wait until evening,” she told him. Later, at school, Horrible Horace and Moidering Maria were mesmerised, captivated and enthralled, trying to work out what their father had in the bag. “I bet it’s a bazooka,” Horrible Horace said to her. “A Diplodocus,” he howled, laughing crazily at her suggestion. “They are hundreds of times bigger than bazookas! What sort of a bag do you think it is? No, don’t tell me, let me guess, it’s an elastic bag that stretches and stretches and stretches!” he hooted. “I still don’t think it’s that,” her Horrible bother replied. “Right, we will,” Horace answered. “I don’t know what has gotten into you two,” said the mother, when Horrible Horace and Moidering Maria pushed excitedly past her that evening, after school. “He’s not in here!” Moidering Maria bemoaned, disappointed that she had not found him in there. “He must be in the sitting room,” said her Horrible brother. Tearing out from the kitchen, he flew down the hallway and into the sitting room. “He’s not in here either!” he groaned. Climbing the stairs, two steps at a time, brother and sister frantically searched the remainder of the house for their father. However, despite searching it thoroughly they were unable to find him. “More haste less speed,” their mother said to them. “Race? What race?” Horace quipped. “The race between the hare and the tortoise, of course,” she answered. “The slowest one won!” she explained. “Oh,” said her Moideringly mad daughter. “Hurray!” they cheered, digging into their food, with gusto. “Yes, where is he?” Moidering Maria asked her mother. “Well what?” she replied, teasing them some. “Where is he?” Maria asked her again. “Please tell us, mum, lest I die of confusion!” Horrible Horace pleaded. All right, I will tell you,” she answered, laughing at their innocence. “He’s at the end of the garden, where he is burning the rubbish. When you get there, tell him that his tea is ready.” They never heard what she was saying to them, because they were already half way along the garden path.